The first time I heard All Dogs was in the summer of 2014, driving home after a job interview that hadn’t gone well. Something came on WRMC, bursting with reckless energy and harmony in turn. I pulled into the back alley on Bakery Lane to fumble with Shazam without endangering traffic. The band was All Dogs; the song was “Farm;” and I was hooked. I found their bandcamp, and downloaded their split tape with Slouch on the spot. During my 3 hour ride back to New Hampshire, I ran through the six song tape five times. I didn’t make it halfway home before I pulled off the highway and bought their 7” too. It had been years since a band had taken hold of me so immediately. Looking back it’s easy to see why: I spent my post-graduation summer bumming around my hometown- alone in a place once defined by friends and family. So, of course the emotional restlessness and nostalgia of “Buddy” and “Farm” moved me. I was stuck in a fruitless search for my “next step” after years of comfortable predictability, so I heard myself in the frustration and self-reproach on “Dumb” and “Every Single Thing.” But above all, I was depressed- emotionally strung out and pining for closure after the end of a major relationship. Between endless days of eating nothing, going nowhere, and seeing no one, there was something like hope in those early songs. Here was all my regret and anger and longing, blasted back at me every time Maryn Jones hit the distortion pedal on “Say.” I still had something to say, too. And it felt like she was saying it in all the ways I couldn’t. Those two EPs – loud, thoughtful, and raw – had a powerful and positive impact on my emotional state. I was still months away from feeling myself again, but in the meantime I could pound the beat on my steering wheel, scream the words, and not feel so alone. Even now, those early songs haven’t lost their power. They still resonate the way they did when I needed them. All Dogs had another lasting effect on me. Those songs were a gateway drug. All Dogs lead to Waxahatchee. Then Cayetana. Then Hop Along, Radiator Hospital, Swearin’, the Sidekicks, Saintseneca, Girlpool, Thin Lips, P.S. Eliot, Chumped, and on and miraculously on. In middle school, I was a suburban punk of the Green Day, Rancid, Offspring variety, but had lost interest during high school and college. Then The Menzingers’ On the Impossible Past sparked my curiosity again, and All Dogs shoved me headlong down the rabbit-hole of a new punk scene. The music had changed- now more earnest, inclusive, and personal. But more importantly, so had the experience of being a fan. At first, every new show was a revelation. My only punk concert before all this was Green Day playing the Verizon Center in 2004. Now, through tiny venues, thoughtful mosh pits, and sparse but dedicated crowds, seeing the bands live felt as intimate as listening alone in my bedroom. All of a sudden, I didn’t like just a fan; I felt like a small part in some collective whole. One show in particular changed the way I listened to the music, and brought this larger feeling about punk into focus: Roger Harvey, the Sidekicks, Cayetana, and All Dogs playing Baby’s All Right this past January. The Sidekicks had just released their excellent LP Runners in the Nerved World, and they were having a release party in Williamsburg. I drove down from Vermont with two friends who hitched a ride to see a different concert the same night. I met up with my brother’s roommate, who lived only a few blocks away. He had grown up in Scranton, PA, and had been a part of the NEPA/Philly scene his whole life. He knew a couple of the musicians playing that night, but seemed more excited just to finally have someone to go a show with. I was beside myself. It was one of my first shows since really getting back into punk, and it had two bands, All Dogs and Cayetana, that would have justified the 6 hour trip alone. Over the course of the show, I got to talk briefly with some of the artists. 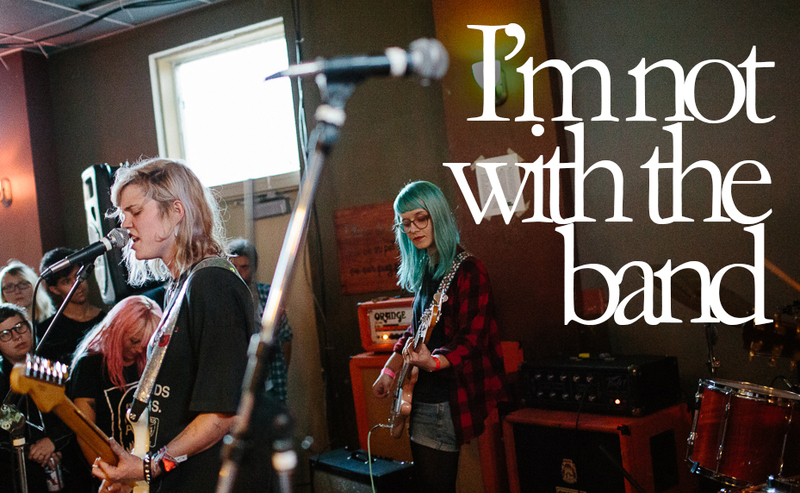 The members of Cayetana were excited to start a tour in warmer climates. Roger Harvey seemed happy someone thought his Three Wolf Moon shirt was funny. And I could hardly contain my excitement when Jesse Withers of All Dogs said they were recording an LP in February. They were all brief, innocuous conversations, but the effect on me was profound- it was the first time that I had been able to speak with anyone whose work had changed my life so positively. It felt so good just say thank you- ostensibly referring to the show, but inwardly thinking of moments of weakness and self-recrimination that the music reflected and made okay. I walked away from the concert that night glowing with the feeling that being a fan in this community was not a one-way street. For years I had simply consumed the music that artists and labels put out. I might have a response, but I kept it to myself. Now, the dynamic had shifted from production/consumption to interaction. I felt like I was a part of a dialogue. When I got back to my brother’s apartment, I opened his computer while explaining to him how this band would change his life. During the show All Dogs had played a few new songs that hadn’t been recorded yet, but one had somehow felt familiar. Ears still ringing from the show, I realized why- there was a live version already on YouTube that I’d played a dozen times. The caption on the video read “a recently completed song that’s still being written down as “New” on their setlists.” The song eventually got a name: “That Kind of Girl.” And six months later, it became the first single off of All Dogs’ debut masterpiece, Kicking Every Day. The record begins in familiar territory for the band, as the opening chords on “Black Hole” immediately recall “Buddy,” the highlight from their 7”. But the album’s new power and breadth comes through with a punch the moment that Nick Harris’s guitar explodes onto the track. Other than their single “Georgia,” Kicking Every Day is the band’s first studio work with Harris on lead guitar. His contributions to their overall sound is striking. His spirited and hook-heavy melodies add great depth to the solid punk foundation supplied by Withers and Bartley. The next track, “How Long,” provides a great example of how he plays off Jones’ vocals: his descent down the fretboard as she calls out “how long till I stop” is one of the most satisfying moments on the album. An often overlooked element to the album’s cohesion is the track order. The two opening songs show off the group’s new musical complexity while still safely residing in the fuzzy punk genre confines of their earlier work. It isn’t until the third track that the sonic diversity of Kicking Every Day really begins to shine through. “Sunday Morning” is an unabashed pop song. “Your Mistakes” falls somewhere between folk, rock, and Americana, thanks to Kyle Gilbride’s organ and some subtle twang. “The Garden,” the stripped down, acoustic closing track, sounds a little like Jones’ current solo project Yowler, and a lot like her early singer-songwriter work. It’s always tricky to experiment with new genres, but on Kicking Every Day, all the departures from All Dogs’s established sound are deftly handled. Every musical risk pays off. all in pieces without warning. Did the same thing, found nothing. Now the falling isn’t stopping. Don’t you ever say that I’m wrong cause I won’t take it. Here again, Jones asserts the legitimacy of pain, uncertainty, and desire. She rejects the misogynistic and ultimately meaningless “that kind of girl” title by defining what kind of girl she is, entirely on her own terms. The result is a compelling self-portrait of the artist- caring, flawed, and brilliant. Whether or not I want it to. Adding to the emotional power of the song are Jones’s vocals, which have never been better. Subdued through the first eleven lines of the song, she shifts up in power and pitch on the words “leading me back to you / what am I supposed to do?” and it feels like a knife through the heart. The song’s balance of heavy music, melancholic lyrics, and vocal delivery makes for the most affecting experiences I have ever had as a listener. A few days before the album was released this August, I took a train down to Richmond, VA to see All Dogs kick off their east coast tour with the Sidekicks. The show was better than I could have hoped for, and I was lucky enough catch Withers and Jones while the band was packing up. Our little conversation reaffirmed everything that I had thought about these musicians and my place in the community. I knew I was just a fan, but they made me feel like a friend. The album was released while I was on another train, this one bound for Chicago. I downloaded my copy somewhere along the way, leaning against the window of the dining car. When “Leading Me Back to You” came on, I could not stop myself from crying, but I didn’t want to stop- this was why the music mattered. One year and a thousand miles had passed since I first heard “Farm,” but the all the old feelings rose again in my chest. This is the most remarkable aspect of the album- the love and the doubt and the pain of the music are so accessible, so immediate, that they simply become your own. I played the rest of the record through, eyes closed, alternately tearing up and smiling to myself. “The Garden” faded out and I opened my eyes. The album started up again. Outside, the midwest rolled by. A million and one thanks to Chad Clemens for putting it on WRMC’s rotation. The kinda-punk, very-DIY, mainly-based-in-Philly scene, made up of the aforementioned bands plus many others like Modern Baseball, Sheer Mag, Moto Surf, Tigers Jaw, Three Man Cannon, Kurt Vile, Little Big League, Glocca Morra, Slaughter Beach, Restorations, Captain, We’re Sinking, Kalufus, Cave People, Title Fight, Kite Party, and many more that I have yet to discover. It was Sylvan Esso at Terminal 5. It’s also worth noting that in Hamlet, the character of Ophelia dies by drowning. This reference was lost on me, but thankfully didn’t go over the head of my intrepid and well-read editor. A close second is the extremely lo-fi version Jones recorded alone in what looks to be a stairwell in 2010. If you’re not moved by the description alone, you need to find yourself a soul.